Educational Qualification : Dy Manager(HR)- Passed Graduation in any Discipline with 60% Marks and PG Diploma/Degree/MBA from any Recognized Institute/University with 60% Marks. Dy Manager(F&A)- Passed Graduation in any Discipline with 60% Marks and Pass CA/ICWA or PG Diploma/Degree/MBA from any Recognized Institute/University with 60% Marks. Dy Manager(C&MM)- Passed BE/B.Tech Degree and MBA in Materials Management/Inventory Control with 60% Marks. Dy Manager(Legal)- Passed Degree in Law with 60% Marks and Registered with BAR Council and 3 Year Practice Experience. Jr. Hindi Translator- Passed PG Degree in Hindi/English with English/Hindi Subject at Graduation Level. 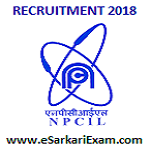 Eligible Candidates can Submit Application at the Official Website of NPCIL Latest by 19th December 2018. Applicants First Logon to NPCIL Official Website. Click on Recruitment of Dy Manager, JHT Link. Now Click on Careers Link. Upload Scan Photo & Sign & Other Documents.